Forgiato is best known in the automotive world for their massive wheels with a distinctly modern design but the company is making news now thanks to their new “retractable hidden headlight grille” for the Chevrolet Camaro – a new accessory for the American muscle car that is making its internet debut in the video below. This new aftermarket item from Forgiato is formally named the DiFalco Retractable Hidden Headlight Grille and the company’s intention is to pay homage to the hideaway headlight design of the first generation Chevrolet Camaro. This kit includes the motorized retractable hidden headlight motors and the sliding “shutters” that serve to provide the look of a set of human eyelids. These unique headlight covers are lined with 36 LED “eyelashes” on each side that serve as the daytime running lights and turn signal indicators with the high tech factory Camaro projection headlights tucked neatly behind. 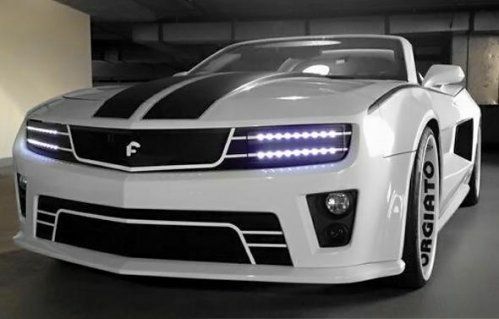 With the push of a button, the shutters split in the middle and open to reveal the standard Chevy Camaro projection headlights – leaving the top eyelid exposed a bit to preserve a unique look while also giving the Camaro a menacing scowl. The DiFalco grille is finished with brushed stainless steel accent trim, matte black grille filler and the familiar Forgiato “F” logo in the middle of the grille. In the image above on the right, the DiFalco Retractable Hidden Headlight Grille has been applied to the Camaro ZL1 Convertible but this package is available for all trimlines of the GM muscle car. This means that any 5th generation Camaro owner can place an order for this unique front end treatment that features an old school design with a modern twist – but it comes with a price. The Forgiato DiFalco grille carries an MSRP of $3,999 (although the link from their own website to a retail outlet lists the price as $3,399). In addition to the new grille package, the heavily modified 5th gen Chevrolet Camaro shown in the image on the right and the video below includes an elaborate widebody package that is not included in the new Retractable Hidden Headlight Grille…just to be clear. The Camaro ZL1 Convertible shown here also wears a uniquely dressed up lower fascia opening but it is unclear whether or not that piece is available for the ZL1 package, if it is offered as an add-on, or if it was a 1-off for this show vehicle. In any case, the new Forgiato DiFalco Retractable Hidden Headlight Grille offers modern Camaro owners a chance to sport the similar hideaway design that was found on the early Camaro – albeit with a high tech twist. One other thing that Forgiato is known for is dressing up cars and surrounding them with gorgeous women – something that is well displayed in their display each year at the SEMA Show. Along those same lines, Forgiato has put together an extensive video showing their new DiFalco Grille featuring the heavily modified Camaro ZL1 Convertible which happens to be autonomous (it drives itself) along with a beautiful woman in a tiny black bikini who has used her key fob to beckon the customized American muscle car. It is unclear whether the Forgiato-modified Camaro ZL1 Convertible ever reaches the gorgeous girl (or why it is so far away from her even though she has the key) but this video offers a great look at this new front end package day and night. While this pricey front end package from Forgiato may not be the kind of thing that the Chevrolet Camaro-owning babyboomers will be lining up to purchase, a feature like this would be right at home on the front end of a new Camaro featuring extensive body work like the one shown in the video below. At almost $4,000, it is unquestionably an expensive option but considering what a set of Forgiato wheels costs, someone rocking a set of Forgiato rollers on their Camaro likely wont bat an eyelash at that suggested retail price.